I published V1 of this in a post on my Fast Company blog about the government’s experiments with identity. 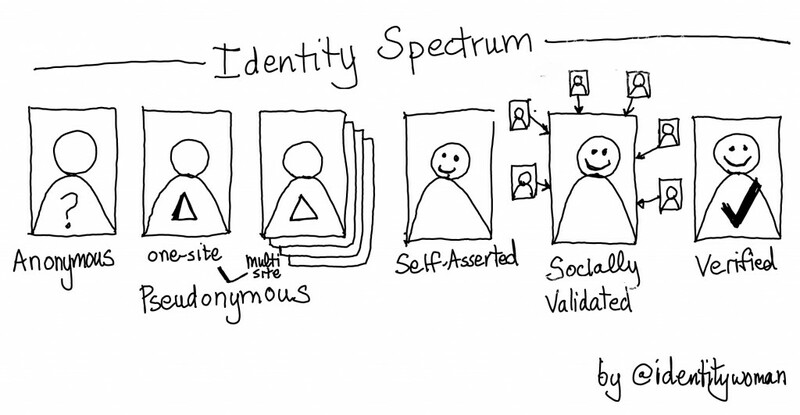 The Identity Spectrum gives a understanding of the different kinds of identity that are possible in digital systems. They are not exculsive – you can mix and match. I will define the terms below and discuss mixing and matching below. Anonymous Identity is on one end of the identity spectrum–basically you use an account or identifier every time go to a Web site–no persistence, no way to connect the search you did last week with the one you did this week. Pseudonymous Identity is where over time you use the same account or identifier over and over again at a site. It usually means you don’t reveal your common/real name or other information that would make you personally identifiable. You could use the same identifier at multiple sites thus creating a correlation between actions on one site and another. Self-Asserted Identity is what is typical on the Web today. You are asked to share your name, date of birth, city of residence, mailing address etc. You fill in forms again and again. You can give “fake” information or true information about yourself–it is up to you. Verified Identity is when there are claims about you that you have had verified by a third party. So for example if you are an employee of a company your employer could issue a claim that you were indeed an employee. You might have your bank verify for your address. etc. You could have a socially verified pseudonymous identity. That is people recognize and acknowledge a pseudonymous handle/avatar name by linking to it in a social graph. You can have verified anonymity where attributes about a handle/avatar are ‘verified’ but the all the information about the verified identity (full name, address, birthdate etc) is not reviled.